The Cumberland & Dumfriesshire Farmers Mart P.L.C. 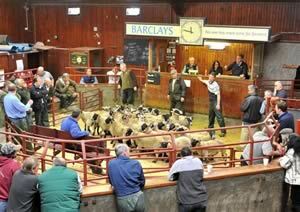 had forward 69 prime cattle, 1 young bulls, 18 over thirty month cattle, 6,439 prime lambs and 6,181 cast ewes & rams at their weekly sale at Longtown on Thursday 9th September, 2010. An increased number of 69 prime cattle saw trade sharper on the week, selling to a top of 180.5p for a British Blue bullock from A. Irving, Toppin Castle and purchased by W. Kirkup & Sons, Butchers, Longtown; Limousin 167.5p Newby and Slealands, 165.5p Toppin Castle, 163.5p Dashwellgreen. Charolais heifers to 174.5p from J.W. Vevers, High Stenries to J.A. Jewitt, Wholesalers, others 167.5p High Stenries, 165.5p Hallburn, 164.5p Upper Mains, 163.5p High Stenries, 161.5p Hallburn; Limousin 173.5p, 169.5p Hallburn, 165.5p Upper Mains; Simmental 163.5p Toppin Castle. British Blue bullock £1,110.08 Toppin Castle; Limousin £1,092.30 Toppin Castle, £1,038.18 Sceughdyke. Charolais heifers £1,087.28, £1,063.63 High Stenries, £1,025.53 Hallburn. Young bulls to 143.5p for Limousin from Whiteclose. A smaller show of cows forward was met by a similar trade on the week, selling to a top of 117.5p for a Limousin heifer from H. & W.G. Robley, Townfoot. Limousin cows to 114.5p (£778.60) from R.M. & P. Armstrong, Slealands, others 111.5p (£780.50) Hightown, 99.5p (£656.70) Allensgreen, 98.5p Rigg Smiddy; Angus 92.5p Allensgreen; Ayrshire 91.5p Brisco Hill. British Blue bullocks to 107.5p (£1,032) Sceughdyke. Limousin bulls to 104.5p Slealands. The Company had forward a massive show of prime lambs. Trade was easier on the week due to lack of demand and larger shows around the country. The overall average was 155.4p. The 1,366 light lambs averaged 156.3p and the 5,073 heavy lambs averaged 154.6p. The sale topped at £85 for Texel lambs from M/s Gracie, Byreburnside and to 200p/kilo for Beltex from M/s Retson, Maidencoats. Other Texels to £84.50 Peela Hill, £80 The Nook; Suffolk x £79.20 Barnglies, £78.80 Upper Mains, £78.50 Rottington Hall; Cheviots £65.20 Chapel & Broomhillbank, £64.80 Chapel; Bleu de Maines £84.50, £76.80, £75 Branxholm Town: Charollais £74.80 Mosside & Edgerston, £69.80 Hardhurst; Halfbreds £65.20 Adderston Shiel, £64.80 Earlside, £62.20 Adderston Shiel; Greyfaces £69.80 Lipwood Well, £68.20 The Side & Corries Mill & Barnshangan; Cheviot Mules £66.50 Granton, £64.80 Tarrasfoot, £63.80 Peela Hill; Blackface £60 Lanehead, £56.50 Mid Harrietsfield, £55.50 Allensgreen; North Country Cheviot £73.50 Tofts of Tain; Swaledale £59.50 Waterloo; Beltex £78.80 Hallsoven; £68.20 Aldery Terrace, £64.80 Stoneflatts; Llynn £65.80 Whiteclose, £64.50 Dunnabie; Zwartbles £54.50 Miller Hill; Shetland £52.50 Cardewlees; Easycare £56.80 Kersheugh. Light lambs to £72 for Beltex from Maidencoats; Suffolk x £58.80 Edges Green; Texel £67.20 Clerkhill, £63.20 Killean; Charollais £56.80 Townfoot; Greyface £55.50 Perterburn, £54.80 Crindledykes; Cheviot Mule £56.80 Peela Hill; Blackface £56.80 Toft House; Swaledale £46.50 Waterloo; Herdwick £57.20 Waterloo; Jacobs £50.20 Hillside. Another monster show of ewes were forward to the usual ring of buyers. Trade again buoyant although £3-£4 easier on the week. The sale topped at £143.50 for Texel rams from Seavers, £138.50 Duns House; Suffolk £126.50 Westhouse, £118 Poolgate; Cheviot £98.50 Skelfhill, ; Charollais £128.50 Severs, £115.50 Poolgate; Leicester £142.50 The Throp, £138.50 Duns House £116.50 Fordlands; Blackface £66.50 Westgate; North Country Cheviot £120.50 Whiteknowe, £116.50 Upper Lybster; Swaledale £76.50 East Unthank & Hollinsclose; Beltex £88.50 Sorbie; Llynn £76.50 Cooilingel. Heavy ewes to £132.50 for Texels from Four O Boot, £124.50 Mull of Galloway; Suffolk £104.50 Severs, £102.40 Westgate; Bleu du Maine £66.50 Hardhurst; Charollais £94.50 Seavers, £88.50 Killough; Halfbred £76.50 Rockcliffe Cross & Milton; Greyface £84.50 Low Ardley, £81.50 Kirknewton; Cheviot Mule £70.50 Patties Hill, £69.50 Outertown; Leicester £96.50 Barshangan, £94.50 Easthouse; North Country Cheviot £93.50 Overacre, £88.50 Tofts of Tain; Beltex £79.50 Hollands, Zwartbles £78.50 Seavers; Oxford £76.50 Guards Farm; Border Leicester £94.50 Westgate; Llynn £72.50 Bairnkine, £70.50 Whitcastle. Hill ewes to £70.50 for Cheviots from Springwells & Priesthaugh, others to £69.50 Crossdykes; Blackface £68.50 Duns House, £66.50 Derwentside; Swaledale £57.50 Gapshield, £56.50 Nunscleugh; Jacob £48.50 Skelfhill; Herdwick £46.50 Laythes.